Use the intelligence gathered by ClickDimensions to score your prospects’ interest in your products and services. 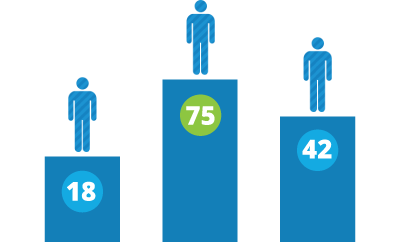 Using the lead score, your sales team can quickly and easily determine which leads to pursue. As ClickDimensions tracks individual visitor activity on your website, each visitor accumulates a score based on his or her visits, page views and more. Scoring is based on values you set, meaning that you can score certain activities or page views higher or lower based on their importance in showing visitor intent. ClickDimensions scores all visitors; not only CRM leads and contacts, but also anonymous visitors. With ClickDimensions web intelligence, you can see who is interested in your company, products or services. 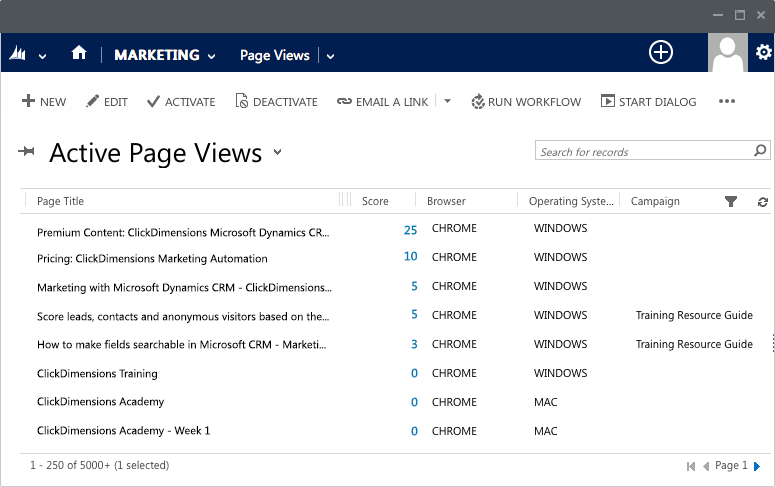 Now the question becomes “how interested are they?” Because all ClickDimensions data is stored within Microsoft CRM, you can use queries and workflow to surface visitors that best meet your criteria. With that information in hand, you can prioritize which are the most interested as quantified by their lead score. 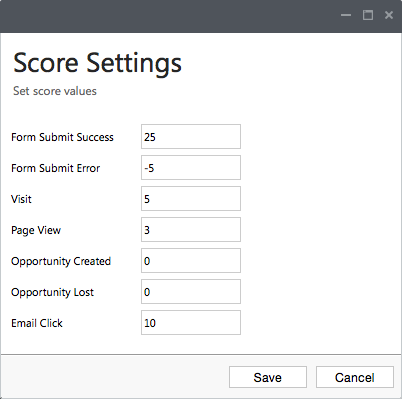 Some pages are better than others at indicating visitor intentions so we’ve given you the ability to specify custom score values on a per-page basis. Want to customize the score so a visit to your pricing page adds 50 points? Want to take 25 points off for visitors who go to your careers page (i.e. job hunter vs. true prospect)? No problem. With ClickDimensions you set the default scoring values based on which tracking events are more important to your organization.